Woke up this morning to find this note stuck to my door and a bloody symbol painted across it. Mums gonna kill me. I don't want know if its blood. It looks like it. But despite the warning, I'm still calling Jason. I'm not doing this alone. The note looks like its been ripped from a book. the top edge is tatty like if you rip a page out across the binding. Its on the same type of paper as the other notes. managed to get rid of it. It creeped me out too much. Here it is for anyone who missed it. It genually just creeps me out... erk..
my dreams have died down, but now somethings on my twitter. For those who dont follow my twitter, my mum took me to the hospital because she was worried at my night terrors and nightmares. The Doctor just said I had an over active imagination and handed me sleep meds. Took some last night, and it seems that for the moment, they're working. However I woke this morning to find this on my twitter. hope flickerS, the facelEss snicker, masks bickEr as heart beats quicker. but You'll just get sicker till yOUr blood gets thicker. If you take the capitals it spells SEE YOU. I've also been researching. It seems I'm not the only one that's seen this man. Noah and his friend who has now passed, Milo, from the youtube channel 'Tribe Twelve.' have seen him. Also two men, Logan and Josh who only started looking into this when Logan was sent his friends journal. From my knowledge, Logan is dead and Josh has been missing for nearly a year. I have read alot of... not very encouraging things. Like people slipping into madness, and killing themselves. I'm concerned that this will also happen to me. If anyone can, please help me. I don't know whats going on, but I could do with all the help possible. I've tried telling people but they just think I'm stressed. The only thing thats stressing me are these dreams and the notes. EDIT: I cant seem to remove it. Every time I try it times out. It cant be a problem with my connection. It's fine. I barely slept last night. Was too scared to close my eyes. Kept thinking I saw him at the window, or at the bottom of the stairs... no, I swear I saw him at the bottom of the stairs. No sleep meant no chance for whatevers leaving these notes around to leave one. I've been having a lot of nightmares. Normally I wouldn't write about stuff like this. But I feel I should. I've been having alot of nightmares lately. It first started as just one or two, that was just a month ago, about 11th november. Then it started getting worse and more graphic. Its only lately that I've really been getting worried. I wake up, normally after dreaming of the screaming children. ITs always children. In the trees. I'm always in a forest and the children are screaming. I look up and they're in bags, blood soaked bags. He takes them. The.. thing. in the suit. he takes them, he steals them and sticks them in the trees for the screaming creature. They have their eyes and mouths sown shut. the thing and his pet. I've started finding pictures scraps of ripped paper with messy scribbled drawings and words next to my bed and across my room. I'm sure these weren't there the night before. This is only a week after I found this. This is from two nights ago. 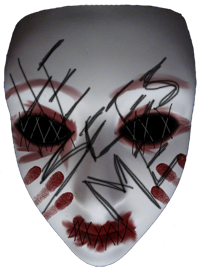 It was just a messy scribble with the words 'HE SEES ME' 'HE SEES ME' and 'TEARS ME' written on it with what looks like blood finger brings and blood on it. I dont think they're dates. Too many numbers. Maybe coordinates? I dont know, I'm getting scared. The dreams are getting worse.